HOPE – The Hope Public Schools Board met Tuesday evening in a pre-holiday special setting and took in a substantial amount of information, some of which it will act upon later. The special Tuesday night session moved the board’s regular November meeting from Nov. 20 to keep the Thanksgiving holiday break clear. The board seated its newest member, Kathryn Dickinson, who represents Zone 6. Dickinson was appointed to the board in October to succeed the late Denver L. “Denny” Dickinson. 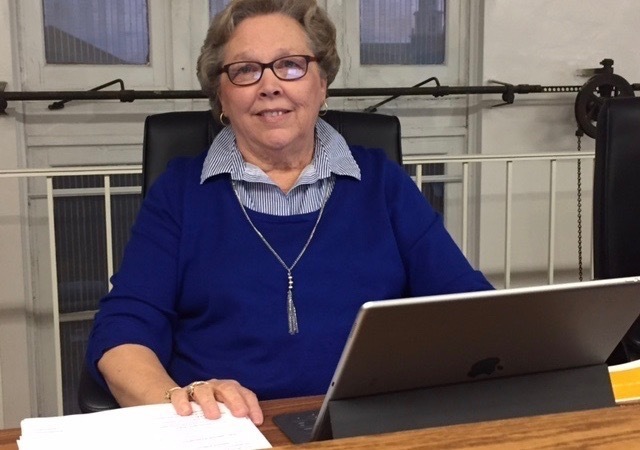 Mrs. Dickinson was employed by the HPSD for 37 years as a classroom teacher and administrator prior to her retirement in 2008. Principal among the reports and board study viewed Tuesday was the new 45-Day Report format which has been implemented districtwide. District Curriculum Coordinator Carla Narlesky told the board the new reporting format has been instituted to streamline the curriculum reporting period as previously required by the Arkansas Department of Education. “What you’re looking at is just the basics,” Narlesky said. The report reflects a new three week unit period into which the curriculum at each campus has now been divided, she said. “You will see every quarter, new data,” Narlesky said. The shift in the unit teaching period will allow better control over grade inflation and give administration and the board a clearer picture of learning progress nearer real time, she said. Narleksy said the shift will also allow teachers to go back to weak points in each unit and strengthen them prior to interim assessment periods and the ACT Aspire summative test administration. The report sets forth goals for each campus and the action steps to be taken within the succeeding report period to obtain each goal; reflects raw data on enrollment, student discipline, teacher attendance, student attendance, and math and literacy assessments, along with a principal’s narrative for each campus. Narleksy apologized in advance for the fact that the 29-page report will only become longer as the school year progresses, noting that was part of the point in providing a cumulative picture for faculty, administration and the board. Also Tuesday, the board heard reports from Superintendent Bobby Hart regarding the development of a Request for Proposals for custodial services and the annual vendor proposal for food services contracts. Hart said the custodial proposal has met with a great deal of interest from vendors, and a pre-bid conference was set for Wednesday morning to review the criteria and eligibility of vendors. “We have had a lot of interest,” he said. Hart said both national and Arkansas vendors have expressed a desire to bid for the contract. He said the food service contract is based upon criteria set by the state, and its timeline is controlled by that criteria. Hart also updated the board concerning the status of the district’s bus fleet and the possibility of shifting to a lease-purchase system. -- Tabled immediate consideration of the position of Dean of Students, pending clarification of the recommendation of the Personnel Policies Committee regarding the salary multiplier for the position. --Received an updated application for the Hope Academy of Public Service for informational review. --Heard a proposal that the district engage with the Hempstead County Bicentennial Commission through the celebration’s education committee to help create a Hempstead County Educator Hall of Fame. --Received the 2017-2018 Report to the Public which was presented in October. --Approved a request by Unity in Action for use of the Hope High School auditorium for a benefit concert. --Accepted resignations from Lillian Neal, paraprofessional; Natasha Bowers, food services; Susan Honore, ALE paraprofessional; and Eric Wilhite, classroom teacher; and, hired Roger Boyd, bus driver; and, Loretta Dalhover, classroom teacher.